C.J. Gabbe introduces the opening panel at the Teacher Villages & More Forum at Del Mar. He sets context for the evening’s discussion by pointing out what is affordable. He also talks about the missing middle in terms of density; that is, the duplexes and other mid-density solutions – between single family homes and high-rises – that aren’t generally being built today. Housing needs to be built that works for all ages and it needs to be able to fit into existing neighborhoods, according to Fred Buzo, Associate State Director of Community for AARP in California. 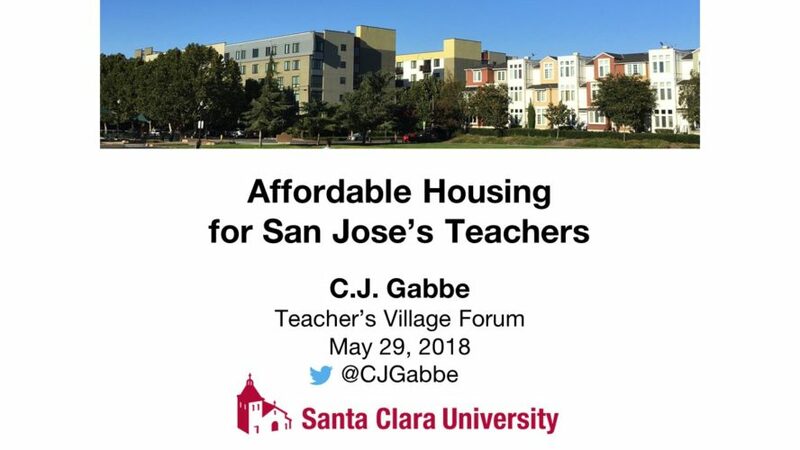 In his opening comments at the Teachers Village & More Forum, he also talks about AARP’s recent charette where the community, together with designers to a comprehensive and focused look at how the new Berryessa Bart station could develop, along with the neighborhood on 13th street. Aboubacar “Asn” Ndiaye, Research & Policy Associate, Working Partnerships U.S.A, provides an overview of his work on housing and transportation issues, as it relates to the portion of the Silicon Valley population that is bypassed due to its high-cost of living. “The way we treat our teachers is ultimately the way we treat our children,” says Daphna Wolfe in her opening comments at the Teachers Village & More Forum at Del Mar High School. Wolfre brings a broad perspective to the panel in her multiple roles of teacher, community leader and San Jose Parks Commissioner. Panelists talk about the need for housing. Fred Buzo touches on a common theme of the evening that all property owners can be part of the solution, whether from adding accessory dwelling units or developing underutilized properties in existing corridors. Asn Ndiaye cites the high-cost of parking as a barrier to building housing and that understanding the real parking needs is important; especially in today’s world where new relatively inexpensive mobility options, such as electric bikes, rideshare and scooters, are available. Daphna Wolfe points out that, while better public transit options are important, building housing near where people work, such as at schools is another part of the solution.